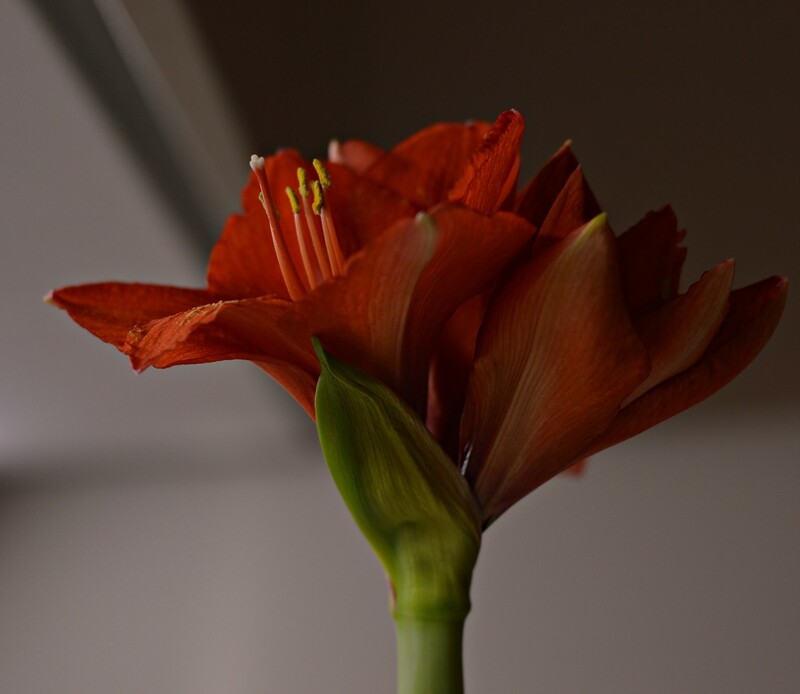 I have a beautiful amaryllis that grows very fast and reminds me every day of the dear friend who gave it to me. I have tried to take this picture with a 50 mm prime lens but focus is a problem! @paul10 thank you very much Paul. Suggestions? You can focus on the subject selecting one of the provided focus points according to your composition. I most probably would have had the focus on the stemen and filaments. By the way, a good thing to train shallow dof and focus with the nifty fity is a newspaper. You can mark a special writen line and try to focus right on this one. @mona65 thank you. Great suggestion! I like this too! But think it needs a more light focus on the flower. You may try a filter on picmonkey or other to see what it looks like highlighted a bit. @gardenfolk thank you for your suggestion. Actually I had tried to give more light to the flower before posting it. I will insist!